(Francisco Kjolseth | The Salt Lake Tribune) The Utah Museum of Fine Art hosts "Chiura Obata: An American Modern," major touring retrospective of Japanese-American artist (1885-1975), whose work captured Western landscapes and his time at the Topaz War Relocation Center (internment camp) during World War II. 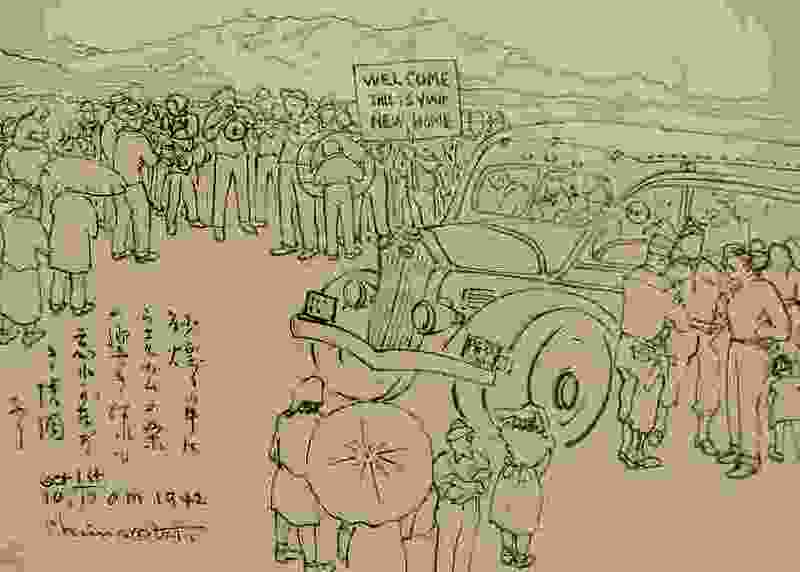 Pictured is "Arrivals Welcomed to Topaz, October 1, 10:10 a.m.," 1942, Ink on paper. Shortly after the attack on Pearl Harbor, Capt. James Higuchi, my uncle, was transferred from his post at the Army’s Camp Roberts in California to Camp Chafee, Ark. James, like the rest of my family, was Japanese-American, which was enough to warrant moving him 2,000 miles from California and from his family’s home in San Jose because of the unfounded fear of sabotage. Thousands of other Japanese-Americans in the military were mustered out then, too, not because of misconduct but for the crime of their race. Thousands more who wanted to join the service were classified 4-C — enemy alien — although they had done nothing wrong. Now, as The Washington Post reported, the Trump administration is developing another plan to limit the ability of immigrants, green card holders and some U.S. citizens to join the military. Once again, supposed fears of a “foreign nexus” are being used to justify an exclusion based on national origin. This latest move follows an administration attempt, which was blocked by a federal judge, to limit immigrants and green card holders from joining the military. That attempt was based, like many recent administration proposals, on animus toward minorities and immigrants. Contrast this with the George W. Bush administration policy that welcomed immigrants and gave them a chance to earn citizenship by serving in the military. Since 9/11, 110,000 immigrants have joined the military. For decades, military service has been a path to greater social mobility and equality. Colin Powell, the son of Jamaican immigrants, rose to the chairmanship of the Joint Chiefs of Staff and then became secretary of state after a career in the Army. Macario Garcia was an immigrant from Mexico and a noncitizen when his actions in World War II led to him receiving the Medal of Honor. In Utah, Clarence Uno became one of the rare Japanese-American immigrants to become a U.S. citizen in 1935, after his service in World War I. He was later sent to a concentration camp in Wyoming after Pearl Harbor, where he died in 1943. His son Raymond moved back to Utah after the war and became the state’s first Asian-American judge. Finally, we have to look no further than the thousands of Japanese-American soldiers who fought bravely during World War II. After the Pentagon dropped the enemy alien classification in 1943, young Japanese-Americans rushed to enlist in the Army in Hawaii, including 19-year-old Daniel Inouye, who left his premed studies at the University of Hawaii to join. Inouye would never become a doctor. He lost his right arm on an Italian hillside in April 1945 attacking a German position. For years, racism kept him and other Japanese-American soldiers from receiving the Medal of Honor, an injustice remedied in 2000. Instead, Inouye was elected to Congress and the Senate, where he served from 1963 until his death in 2012. Two other Japanese-American soldiers, James Okubo and Joe Hayashi, received the Medal of Honor for their wartime bravery committed while their families were incarcerated with my relatives at the Heart Mountain War Relocation Center in Wyoming. Yes, some of the bravest American soldiers during World War II joined the military from their unjust imprisonment in a series of camps stretching from California to Arkansas. When Inouye gave the keynote speech at the grand opening of the Heart Mountain interpretive center in 2011, he said he did not know if he would have joined the Army if he and his family had been imprisoned. The lessons I have learned as the leader of the Heart Mountain Wyoming Foundation and researching my upcoming book about the incarceration — “Setsuko’s Secret” — have shown me that we are greater as a nation when we all work together. The Army learned that during the war when Japanese-American soldiers took on the hardest fighting. Certainly, the Lost Battalion in France knew that when Japanese-American soldiers rescued them while surrounded by Germans in the Vosges Mountains. Our military represents our country better when it reflects the full diversity of the people who live here and want to serve. Using misguided security concerns to limit that diversity doesn’t make us stronger. The memories of Daniel Inouye, James Okubo and Joe Hayashi can tell us that.